Hotel Imperial Garoupe Situated on Cap d'Antibes, the Mediterranean-style Hotel Imperial Garoupe features a private beach area and an outdoor swimming pool. It offers rooms and suites that open to a balcony or terrace with garden views. 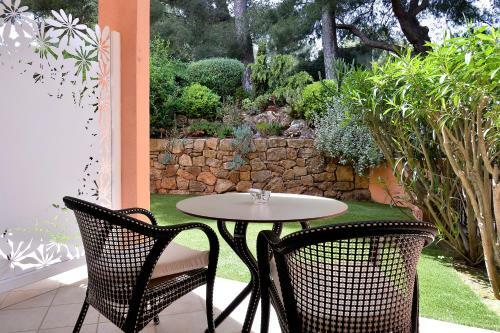 Cannes City lies within 10 km Antibes Train Station is 3 km from Hotel Imperial Garoupe, while the international airport of Nice is at a distance of 25 km..
L'Orangeraie du Cap price per day from € 130 . Villa Fabulite price per day from € 90 . Chambre d'hôtes "La Bastide des Eucalyptus" price per day from € 70 . Hôtel Josse price per day from € 130 . Royal Antibes - Luxury Hotel, Résidence, Beach & Spa . Hôtel Marineland Resort price per day from € 145 . 1. Head east on Rue Gabriel Fauré toward Av. Gustave V.
2. Turn left onto Av. Gustave V.
3. Turn right onto Av. de Suède. 4. Turn right onto Av. de Verdun. 7. Continue onto Route du Bord de Mer. 9. Continue onto Av. du 11 Novembre. 10. Slight right toward Av. Robert Soleau. 11. Continue straight onto Av. Robert Soleau. 12. Slight left to stay on Av. Robert Soleau. 13. Continue straight onto Pl. Général de Gaulle. 14. Turn right to stay on Pl. Général de Gaulle. 15. Take the 1st left onto Bd Albert 1er. 16. Turn left at the 3rd cross street onto Av. Meissonnier. 17. Slight left onto Av. Maréchal Reille. 18. Turn left onto Av. 24 Août. 19. Sharp right onto Rue de Fersen. Destination will be on the left. Park Floral de Nice, Nice, 13.8 km from the centre of town of Antibes. 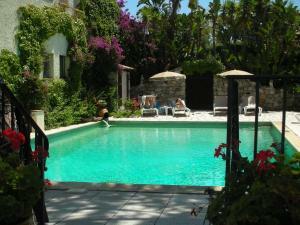 Golf club Cannes-Mandelieu (Old), 15.5 km from the centre of town of Antibes. Golf club Saint Donat, 15.6 km from the centre of town of Antibes. Promenade des Anglais, Nice, 18 km from the centre of town of Antibes. Art museum Histoire Palais Massena, Nice, 18.1 km from the centre of town of Antibes. Museum National Marc Chagall, Nice, 19.8 km from the centre of town of Antibes. Vieille Ville, Nice, 19.9 km from the centre of town of Antibes. Ski resort Beuil-les-Launes, recommended ski resort for experts. 61 km from town of Antibes. Ski resort Auron, very good nightlife, many restaurants and pubs. 75 km from town of Antibes. Ski resort Espace Lumière, recommended ski resort for experts. 93 km from town of Antibes.